Dynamic Digital Advertising, Americas principal custom website design company, provides businesses based anywhere in the United States with a proprietary website design and development process that guides the construction of a website capable of ranking in the top results of major search engines like Google, Yahoo, and MSN. As Dynamic Digital Advertisings most effective website design tool, the hybrid process outlines the fourteen steps that DDA will take to secure the highest possible search engine rankings, draw the largest possible number of targeted visitors, and turn the greatest possible number of the those visitors into customers. As a premier graphic design company, Dynamic Digital Advertising gives a multitude of choices when it comes to selecting the right graphic design for their marketing material. The many choices come from Dynamic Digital Advertisings housing of one of the expansive graphic design service offerings in the entire country. No matter what you need, DDA has it: everything from trade show graphic design, large format graphic design, and brochures to virtual reality, 3D animation, and digital illustration is at your fingertips. Audio and visual stimulation is the best method for teaching humans which means written black and white manuals are not the ideal medium for explaining concepts and techniques to new students, employees, etc. Contact Dynamic Digital Advertising (DDA) for CD-ROM training tools that are not only aurally- and visually-stimulating but that also offer user interactivity for enhanced processing, storage, and recall. you can begin benefiting from more effective training tomorrow. Interaction with a human or animated character has a positive effect on how humans learn and makes processing, as well as remembering, information easy, enjoyable, and effective. Dynamic Digital Advertising understands that the integration of hosts, through a voice, an on-screen narrator, or an animated character, can be useful and effective. With our state-of-the-art digital video production studio as well as a team of skilled 3D animators, DDA can provide any type of CD-ROM host requested by customers. Furthermore, Dynamic Digital Advertising maintains a department of full-time copywriters and script writers who work with clients to create a clear, concise, and compelling message. Virtual reality shows processes or mechanics that an audience normally could not see. Continuing Medical Education (CME) and medical students can observe cellular apoptosis in the presence of a new chemotherapy drug, while new mechanics can see the negative consequences of the improper maintenance of a machine. DDAs graphic designers can create a virtual world on CD-ROM that users can visit and revisit as many times as they need to properly comprehend the material. Though DDAs CD-ROMs are high-end, multimedia tools, the information they contain may not be as comprehensive or updated as the information available on your website. Dynamic Digital Advertising avoids this potential pitfall by including hyperlinks in critical areas. These hyperlinks take a user to a specific page which can provide extensive information, custom databases, corporate videos, and much more. As a professional custom website design company, Dynamic Digital Advertising can provide this type of website for you. DDA-designed websites not only entertain and educate users who enter via the CD-ROMs links but also attract a large number of visitors who are interested in learning more about or making a purchase from your company or organization. The long-term cost-effectiveness of interactive CD-ROM training tools makes them the clear choice for corporate or educational training. Not only do users learn and remember more information, they also more fully enjoy the training process. CD-ROMs can be used at on-site training seminars or explored in the comfort of a persons home or office; additionally, more information is learned, remembered, and put into everyday use. Dynamic Digital Advertising offers the multimedia tools that result in higher levels of user understanding. Contact DDA to get more effective training tools today. 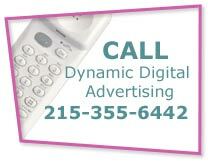 Located in the Philadelphia area, Dynamic Digital Advertising has been developing the interactive multimedia as well as the print- and web-based marketing materials that please clients and their students, customers, investors, employers, etc. DDA has clients in nearly every area in the United States due to our commitment to state-of-the-art communication technology such as webcasting. Whether for custom website design and development, search engine marketing, trade show graphic design, custom web database programming, etc., Dynamic Digital Advertising turns marketing campaigns from mundane and unmemorable to unique and unforgettable. Call DDA today and start increasing your profit potential tomorrow.